Many users will choose to buy a Samsung phone if they are going to switch from other phone system to Android OS. Then, which Samsung smart phone model is better? It is no doubt the latest Samsung Galaxy S6, which comes with a 5.10-inch touchscreen display with a resolution of 1440 pixels by 2560 pixels at a PPI of 577 pixels per inch. It runs Android 5.0 and is powered by a 2550mAh non removable battery. When you get a new Samsung Galaxy S6, you must can't wait to enjoy it as quickly as possible. However, in order to use it normally and conveniently, you need to transfer everything essential from your old phone to the new Galaxy S6. Want to perform the data transfer easily and quickly? 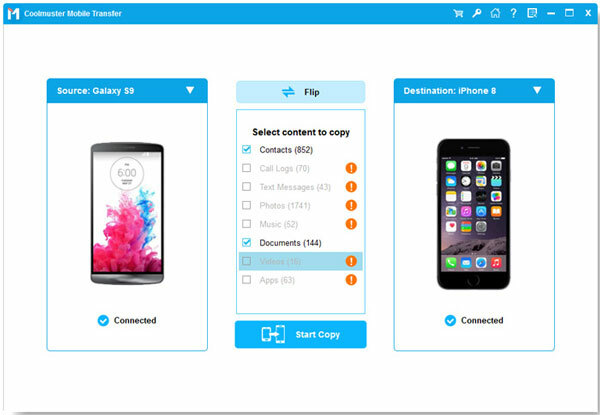 We kindly recommend a third-party tool named the Coolmuster Mobile Transfer, with which you can share all contacts, media files (photos, videos and music) and more between any two smartphones, such as Nokia and Samsung Galaxy S6 or S6 Edge. 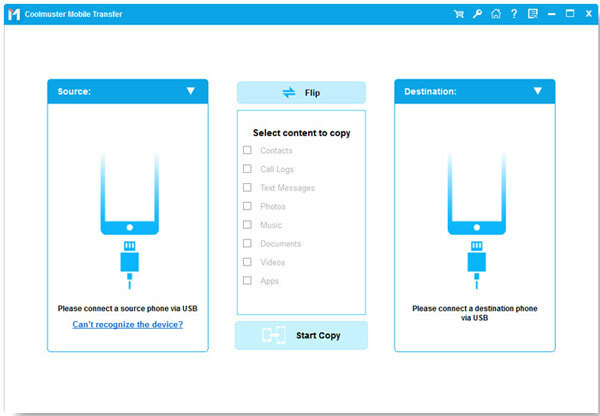 Why not follow us to see how to use the Mobile Transfer to copy media files from Nokia Symbian to Samsung Galaxy S6/S6 Edge (+) in 3 steps? You might also fall in love with this software. How to Copy Nokia Photos/Videos/Songs to Samsung Galaxy S6/S6 Edge? Choose the right version: Windows or Mac, to be downloaded and installed on your computer. After installed and launched this software on your computer, you will have a rough idea on what it can do through the primary interface. Choose the "Phone to Phone Transfer" option and click "Start" button. Then, you need to use two USB cables to connect both your Nokia and Samsung Galaxy S6 to your computer. The software detects both devices soon and displays them. Check the files list on the above and tick off the "Photos", "Videos" and "Music" tabs. When you finished selecting what files you want to transfer, you can click the left or right arrow in the middle of the program interface to start the transfer. Everything will be transferred without any quality loss.